The site of a beautifully lit Hanukkah menorah in the window brings back memories of family, childhood and joyous holiday celebrations. However many menorahs wind up covered in dripped candle wax that’s impossible to scrape off without ruining the menorah. Cleaning candle wax off a Hanukkah menorah is very easy, and will help keep preserve the beauty of your menorah for generations to come. For a quick clean up of large amounts of wax, simply place your menorah in the freezer for a few hours. 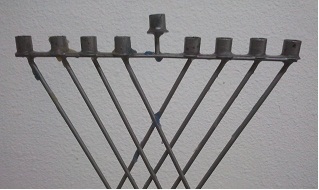 The wax freezes and breaks off the menorah quickly. This freezing method is fast and easy, but will still leave small amounts of wax on the menorah. Freezing works best for ceramic menorahs. For a more thorough clean up use boiling hot water to loosen up the wax. Boil water in a tea kettle, and then slowly pour the water over the menorah. Go one branch at a time, and peel the soft wax off slowly. Make sure you hold the menorah with a towel as it can get very hot. Before the menorah has a chance to cool down, polish it with soft cloth to remove leftover wax and prevent water stains. Hanukkah menorahs make valuable heirlooms, and brighten up the home during the holidays. Keeping your menorah clean will extend it’s life and it’s beauty.